Our last Fall Fashion guest post is by the sister, Kyla. We've had a great time putting these together for you and are definitely coming up with some new ideas. Fashion. I can't say that I am a trendsetter or fashionista. However, I have always enjoyed buying key pieces of clothing that added style to my wardrobe. I believe in paying for a quality piece of clothing instead of buying a bunch of cheap clothing that doesn't fit or wear properly. Having said that, now that I am a stay-at-home mom, I don't have that extra money for those splurge items. I am also just working through the multiple stages and sizes your body goes through after getting pregnant, having babies, breastfeeding, etc., etc. I am finding that now I can get a few keys pieces of clothing that can amp up my wardrobe and make me feel stylish and good about myself. I feel much more confidant when I am dressed well and style my hair. I don't necessarily follow trends or what is "in" for the season. I just gravitate towards clothing that suits my style, that is comfortable and fits into my lifestyle. A few weekends ago, I had a lovely day out with my sister and my two cousins. I wasn't planning on buying ANYTHING but of course everything was fitting beautifully and looked pretty good on me. Note to self - running in a 5 km race before shopping is a great way to make the trying on of clothes so much easier. What did I purchase? Well let me show you. Pardon the not so great photos and somewhat dirty mirror.....my bad. 1. 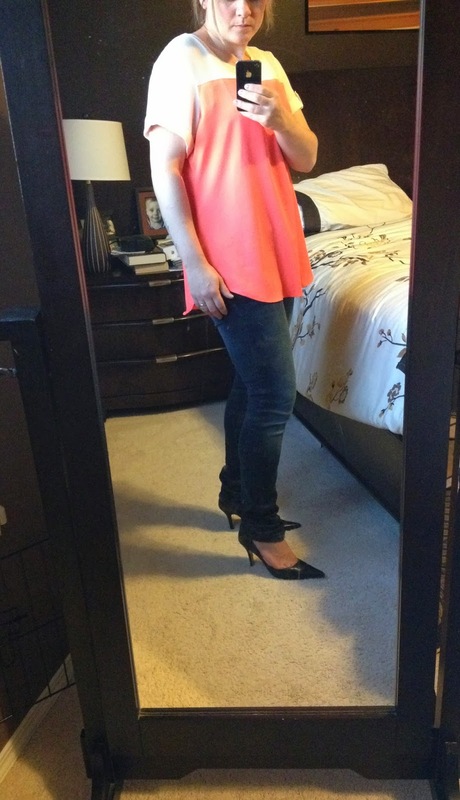 My go to skinny jean over the past 3 years are by Jessica Simpson. They are inexpensive ($59) and fit wonderfully. 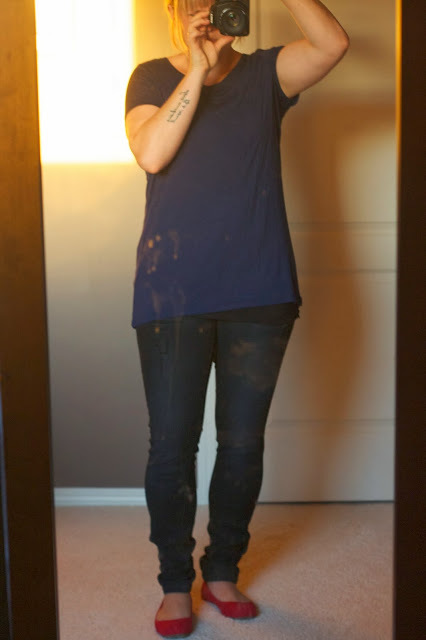 I am on my third pair and while out with the girls I bought a pair of black skinny jeans (I already have the dark blue wash). 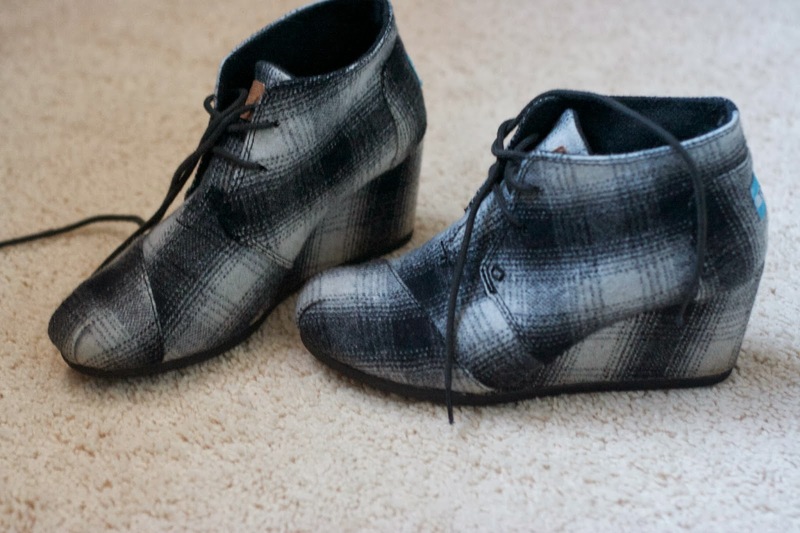 They are a great addition to my wardrobe and very versatile. These skinnies are paired with my red Toms and my new Vero Moda cardigan in navy. It is very comfortable and so soft. I bought the cardigan at Tonic. 2. I bought a couple of comfortable and casual tops. Both from The Bay. 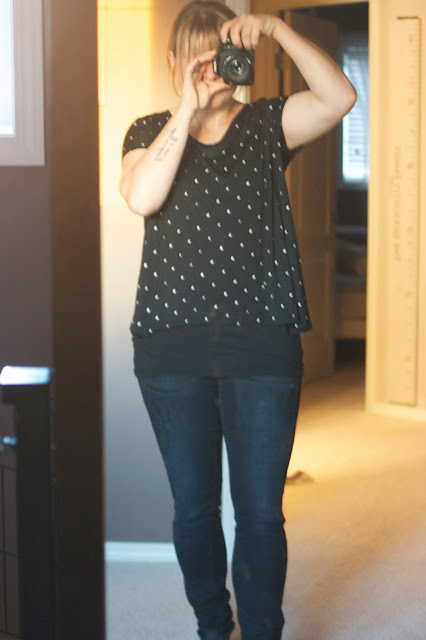 The black angular cut top with polka dots is by Kensie. This outfit is paired with my yellow Toms. 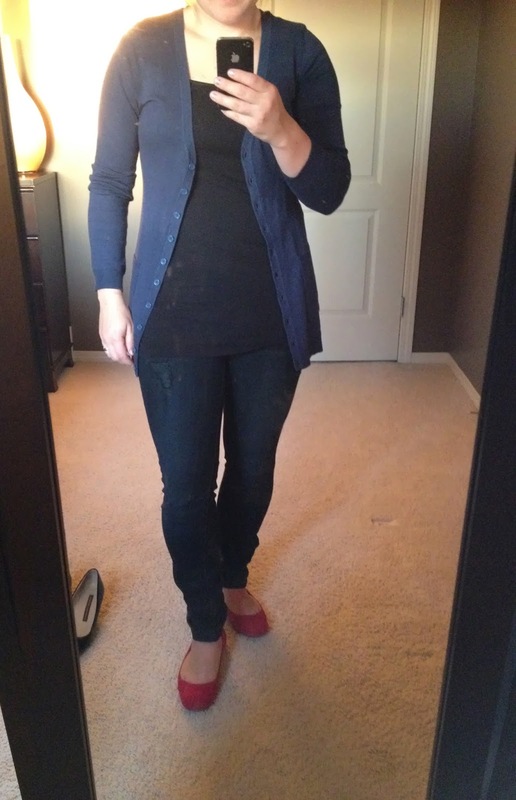 The other top is a soft navy top by Vero Moda. 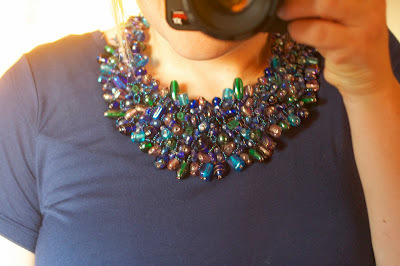 My other favourite go-to top is one I bought at www.simons.ca (my favourite online shopping spot). I have the top in orange and in black. 3. When I thought I had spent enough, we visited Tonic's second location downtown and I came across this beauty of a sweater. I love how it hugs my hips and has cozy elbow pads. It is also by Vero Moda. I paired the sweater with my blue Jessica Simpson skinny jeans and my Chinese Laundry boots. 4. I bought three dresses while on our shopping trip. 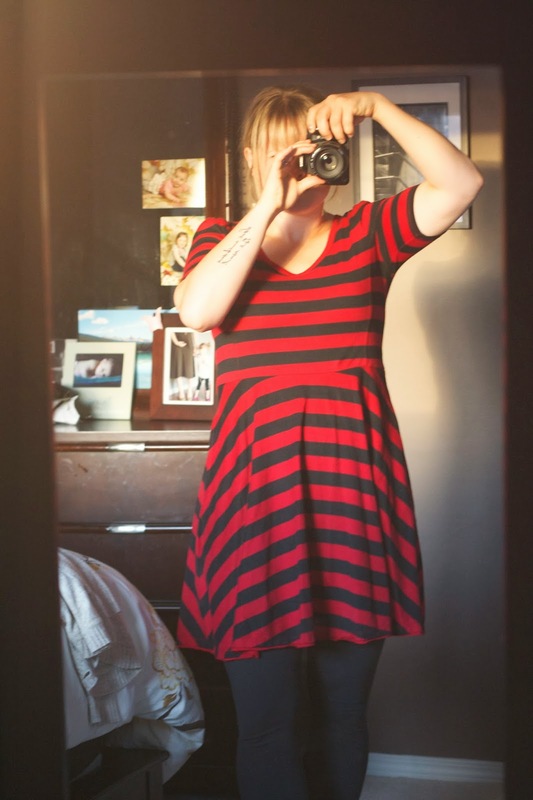 Each with can be dressed down or up with jeans, leggings or tights. They are all so comfortable so I can wear them while chasing the girls. Also, two of them have pockets and I love a dress with pockets. 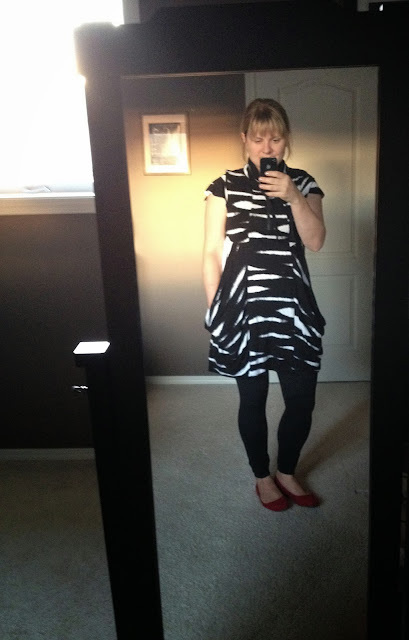 Dress bought at The Bay. Dress is by Kensie. It also comes in a plain grey. 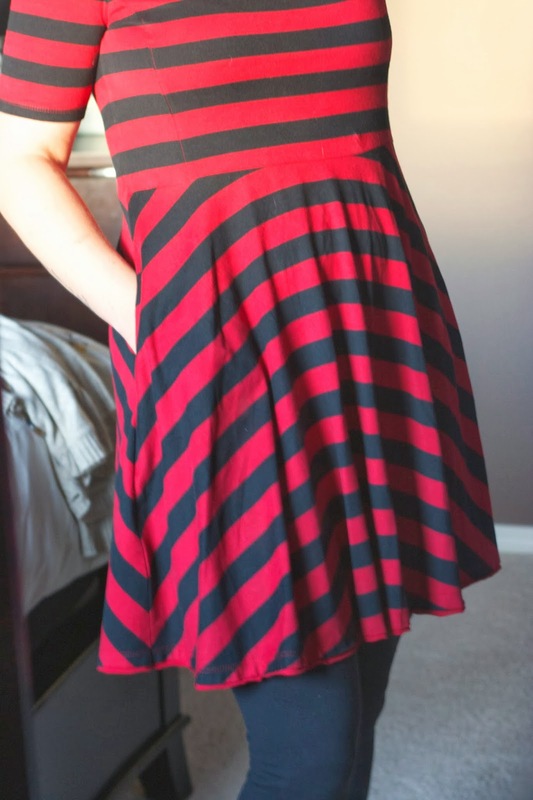 Dress by Pink Martini. Bought at Tonic. Paired with the navy blue Vero Moda cardigan and Chinese Laundry boots. 5. One of my favourite colour combinations is brown and black. I have been trying to put together a similar ensemble to the one I saw on Pinterest. 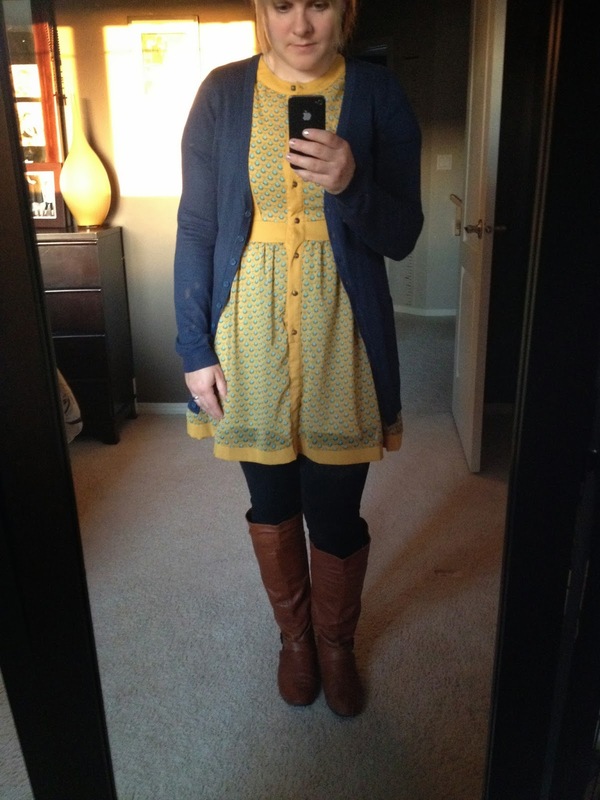 I already had the dress (comfy and flattering dress, 15$ from Old Navy, the boots and the belt from another top). The sweater is actually a breastfeeding sweater. It works ok but I am still searching for a darker brown sweater. 6. I have a couple of fun accessories/shoes that I have purchased over the past couple of years. And yes, this is actually my fourth pair of Toms shoes. The necklace is a great addition to a basic tee and the wedges are so comfortable a great addition to my fall/winter wardrobe. I live for fall fashion (ok, not fashion per say but fall clothes...). I have been waiting and waiting to be able to wear my sweaters and jeans. Yes, I enjoy summer - the feel of the warm sun on my face and the cool grass on my toes, but fall and winter are my seasons. I live for the crisp air and layers of clothing. Yay for fall! I hope you enjoyed my post. Happy Friday. I really love the Vero Moda brand. They have a great range of styles, thier sizes seem to fit me, and the prices are mostly reasonable. Now I need to go shopping to check out some of thier new pieces! Are the Jessica Simpson jeans from the Bay? Yes, I got them at The Bay. I actually bought my first pair at Winners but the other two I bought at The Bay. They were just on sale last week for $49.99. Saw the sale online. Not sure if it is still on though. I really like Vero Moda as well. Good price and actually good quality as well. Love all of them! Especially the sweater with the elbow patches! I love your outfits Kyla! 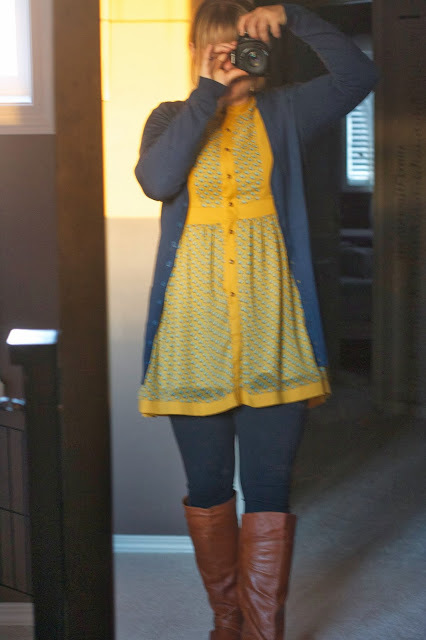 My personal fave is tne sweater with the brown boots followed by the yellow dress and navy cardi. And might I also add that I think your brown boots are fabulous! I am in the market for new boots and I think yours are a perfect color. I also 100% agree with the love of black and brown. I never used to wear together and now my fave color combo! Talk about a yummy mummy! Christy, I bought the boots at The Bay a few years ago but I found them on the Chinese Laundry website so they are still around. Great style, Kyle! Seriously, I would wear all of your outfits! Functional and so cute!